Hike is from Tramway trailhead. Forge up West Clear Creek to Maxwell Trail. 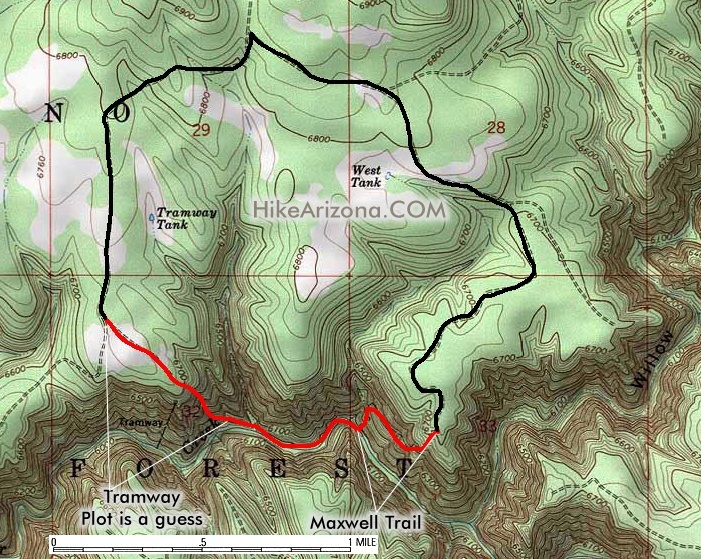 Out on Maxwell Trail and follow 3.5 miles of roads back to Tramway trailhead. Another option would be to double back instead of hiking the roads. Story:A couple of old grade school and high school friends and I made this hike this extended Memorial Day weekend. There aren't very many times when we can all be together, so we all traveled from across the country to meet in Phoenix. The only problem with that is because none of us have been hiking in Arizona before, we planned our trip at the beginning of fire season! We originally planned our hike to be somewhere on the Highline Trail, but soon found out that the entire lower rim area of Tonto National Forrest was closed due to fire restriction. Since we got in late and had some "misplaced" baggage issues we were unable to find a trailhead that night. We woke up on Friday and headed to the nearest ranger station to find out which areas weren't closed. Thanks to the wonderful people at the Payson Ranger District and the Mogollon Rim Ranger District we were able to find this trail. Finding the trailhead was very easy and it was well labeled, however if your vehicle has low clearance you may want to park it where FR 81 E and FR 693 meet, whereas there are many difficult areas to pass. We were planning on being in the woods for 5 days, so we loaded up our packs and hit the trail, at the top of FR 693. Once we walked the 2 miles to the top of canyon, the view was absolutely breathtaking. Being from Ohio, we don't get to see that kind of beauty very often. After we rehydrated, we decided to start the knee-busting trip down the switchback-laden trail (we did not have them, but I would definitely recommend trekking poles). We were able to do it in 35-45 minutes, depending if you had the light or heavy pack. The view was amazing; with great perspectives both up and down the canyon along the West Clear Creek, although I would stop to take it in (the terrain demands your utmost attention). We made it down to the bottom of the trail in one piece and proceeded along the trail to the nearest campsite. We got extremely lucky because the group that was there was packing up and getting ready to leave. While a couple of us stayed behind to squat on the site, others decided to hike up river to see if there was any other campsites. They returned and said the one we found at the bottom of the Tramway Trail is, by far, the best, although there is not a shortage of quality sites either way (but be prepared to get your feet wet). There is an excellent swimming/cooling off area less than 100 feet from the campsite with a great area to fill up water. The site was large enough for our 4-person tent and two 2-person tents with plenty of room to spare for other tents and activities. The ground at the campsite is mostly ash and soft dirt and sand. I walked around barefoot while my various footwear dried out. The only drawback to this campsite location is the fact that it is at the bottom of the Tramway Trail, pretty much on the trail to the other sites. So if you are looking for a place with constant seclusion, you may want to go either up or down river. We had maybe a dozen groups come thru our site the entire time we were there, although most groups tried to avoid cutting thru our site. We set up camp and unloaded our packs for the weekend. During our stay, a couple of us decided to go on some day hikes, both up and down the river. If you hike up river for about 15-20 minutes, there is another large campsite, just before the Maxwell Trail. Down river, there are also many other excellent areas to camp, including across from a natural spring feeding into the West Clear Creek. One day we decided to take an extended day hike down the river. We did about 12 miles round trip, but it was very demanding and very wet. I would recommend either sandals or shoes that dry quickly for any hiking down river. There are even more amazing areas, including a giant cove about 3/4 of a mile from the bottom of the trail down the river. We stayed until Tuesday morning and hiked out on the Maxwell trail, which is a little easier, not as steep with fewer switchbacks. All in all, we had a wonderful and relaxing time. We were able to do everything that we wanted to do except have a campfire. I am not sure if we will ever be back to Arizona for hiking, but if there are areas that are even half as beautiful as this, you won't have to ask me twice. The trail is one of the only two maintained routes into the upper end of West Clear Creek from the north side. It is a steep trail, affording views of the creek from the rim. The trail lies within the West Clear Creek Wilderness and is closed to the use of motorized and mechanized transport (including bicycles). The trail is not suitable for horse traffic. The Tramway Trail starts at the south side of the parking area. Portions of West Clear Creek may be seen from the trail as the creek winds its way through the sinuous canyon. Good views of the various rock strata that make up the steep-walled canyon of West Clear Creek are afforded in the upper stretch of the trail. The rocks exposed near the rim are predominantly limestone laid down when the area was covered by a shallow sea. Once in the canyon, the rock type changes to sandstone, the result of deposition as sediment in an ancient ocean and by eolian (windblown) deposition. Look for the cross-bedding apparent in many of the cliff faces from this eolian deposition. Due to the southerly exposure of the trail, vegetation found on this side of the canyon consists of more heat-tolerant species such as yucca, agave, and shrub oak. Near the bottom of the canyon, these heat-tolerant plants are replaced by more typical upper riparian vegetation of Douglas-Fir, white fir, pine, oak, and ash. Growing along the creek are wild sunflowers, cattails, locust, wild grape, willows, and box elder. The trail ends at the creek but by bushwhacking it is possible to access areas downstream and upstream, including the Maxwell Trail #37. The Maxwell Trail starts near the end of FR 81E at the northwest corner of the parking area. The trail switchbacks to the edge of the rim and begins its steep descent into the canyon. Please be sure to stay on the trail in the section of the switchbacks as shortcutting destroys vegetation and aggravates erosion of the trail and surrounding ground cover. The rocks exposed above the rim are predominately limestone laid down when the area was covered by a shallow sea. Once in the canyon the rock type changes to sandstone, which was also deposited as a sediment in an ancient ocean. The overstory vegetation along the trail consists of Transition Zone species of ponderosa pine, Douglas fir, and gambel oak. The acorns of the gambel oak were utilized by Native Americans as a food resource because of their high nutritive value. As the trail nears the creek, the vegetation representative of a riparian community is encountered including red-osier dogwood, ash, willow, wild rose, canyon grape, box elder and poison ivy (learn to identify and avoid this three-leafed plant). The quiet pools characteristic of the creek provide habitat for blue gill, round-tailed chub, and suckers. This maintained trail ends at the creek but by bushwhacking and wading it is possible to access areas upstream and downstream of the trail. Location: Southeast of Flagstaff on roads that are either paved or graveled and suitable for passenger cars in most weather. 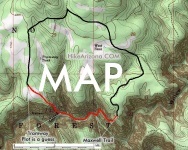 Access: From Happy Jack Ranger Station, follow Forest Highway 3 (Lake Mary Road) south 7.5 miles to Forest Road (FR) 81. Go right (west) on FR 81 approximately 4 miles to the junction of FR 81 and FR 81E. Go left on FR 81E and go approximately 4 miles to FR 693. Take FR 693. Once on FR693 drive 1.2 miles to a fork in the road. (It’s marked FR 9392N and someone has painted a T under the number) Turn left at that fork and drive less than a half-mile to the trailhead. High clearance vehicles are recommended and the road may not be passable during wet weather. From Clints Well (junction of State Route 87 and the FH-3) drive north on FH-3 approximately 7 miles to FR 81. Turn left (west) and proceed as above. From Happy Jack Ranger Station, follow Forest Highway 3 (Lake Mary Road) south for 7.5 miles to Forest Road (FR) 81. Go right (west) on FR 81 approximately 4 miles to the junction of FR 81 and FR 81E. Go left on FR 81E to the end of the road. High clearance vehicles are recommended and the road may not be passable during wet weather.